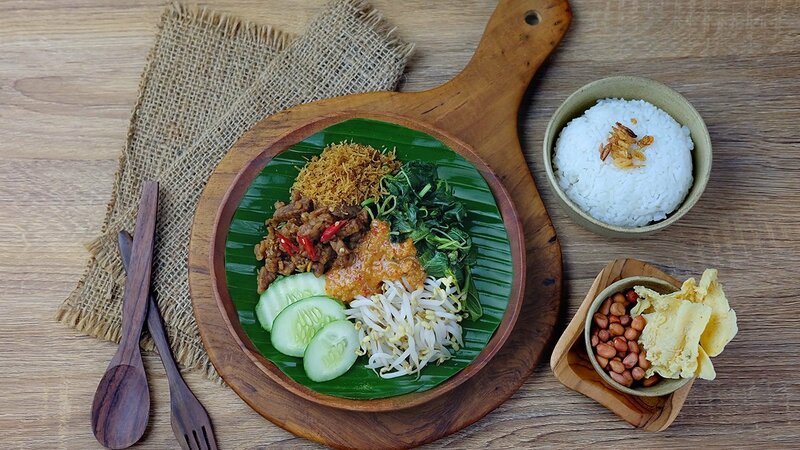 Pecel rice is a Javanese typical dish that served with Pecel (boiled vegetables and peanut sauce). Vegans will love it. Rinse rice and mix with Knorr Lime Powder to avoid the rice dry. Wash all vegetables on top with boiled water. Store in the refrigerator in a closed container if not directly used. Make sauce by mixing peanut spices with boiled water, acid water, and lime juice. Put white rice on a serving plate. Arrange vegetables on the rice. Pour the pecel sauce over the vegetables. Add rempeyek (nut crackers) as garnish.